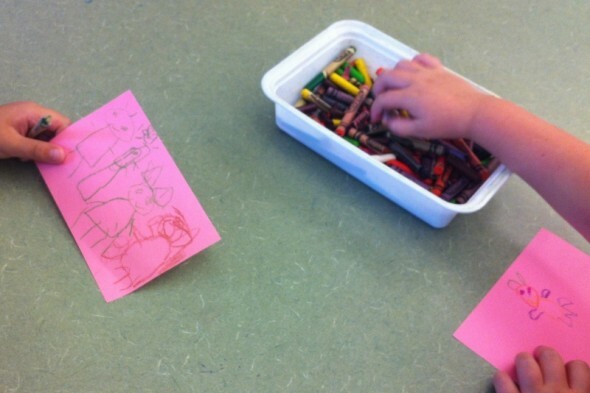 In kindergarten we’re getting ready to check out our library books for the first time this week, so last week we decorated our library cards. We talked about respecting our library books, not fighting over books if someone else has what we want…that sort of thing. The kindergarten teachers read Chrystanthemum for Respect Me Week, and I always forget that and do it the first week of school with the kids. And since I really wanted to get them started with books next week, I kind of left Respect Me Week at that with kindergarten. I read My Name Is Elizabeth! by Annika Dunklee and Matthew Forsythe and My Name Is Yoon by Helen Recorvits with the first grade classes. My Name Is Elizabeth! is a really charming book released earlier this year about a little girl who does not want to be called Beth, or Liz, or Betsy. And she makes sure everyone in town gets it right. 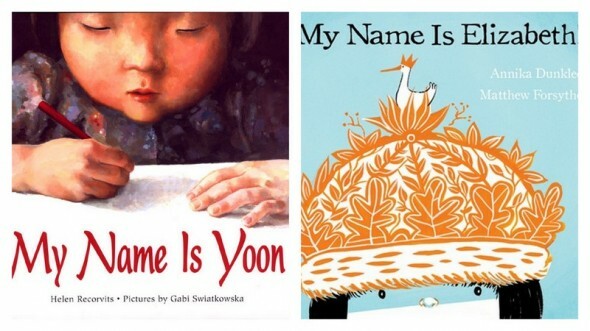 And My Name Is Yoon is a much lauded book about a little girl who moves to America from Korea and does not like the way her name looks when written in English. Her struggles to fit in here in America are revealed in her reluctance to learn this new alphabet and be this new version of Yoon that looks so different from what she knew in Korea. These are not anti-bullying books, but when I couldn’t get my hands on Hooway for Wodney Wat in time I decided to go with these and talk about the value of your own identity rather than bullying. Both of these books were a huge hit, bigger than I expected them to be. The kids loved reading and talking about the importance of a name, your identity, and asserting it in the different ways that Elizabeth and Yoon do. I was surprised by this one, they were really into it. 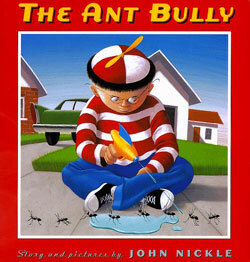 With my second graders I read The Ant Bully by John Nickle. This is a quirky one, but I’d checked out a lot of my good titles (like The Recess Queen, Mim, Gym, and June) to classroom teachers for second grade. The message came through loud and clear, though, and the kids loved it. We talked about walking a mile in someone else’s shoes and tried to imagine other animals who have a really tough life. They had a lot of empathy for both characters in the end, and they were positive that Sid could be reformed with a visit to the ant colony. And the kids were great at extrapolating; if Lucas picked on the ants because Sid picked on him, maybe someone even bigger was picking on Sid. And then they shared experiences they’d had seeing bullies outside of a school setting (one little girl said she’d seen a man hit his wife once in a store). They really understand what bullying is and what it causes…they all knew that Lucas was looking for someone smaller to pick on to relieve his own helplessness with his bully. I got great discussions out of this book, beyond what I was expecting. And then in 3rd grade we read the amazing Patricia Polacco’sMr. Lincoln’s Way. This was another powerful one that surprised me. “Mean Gene” has a racist father who pressures him to avoid those who are “not our kind”, but his wonderfully perceptive African American principal Mr. Lincoln finds a way to get through to him and change his life. Gene comes close to calling Mr. Lincoln the “N” word but stops himself after the first letter. And when I asked students who knew what the “N” word was, every black student knew it but almost none of the other students did. And when I explained (without saying the word, obviously) what it’s ugly meaning was many of them were shocked that someone would think to call anyone a name based on their skin color. 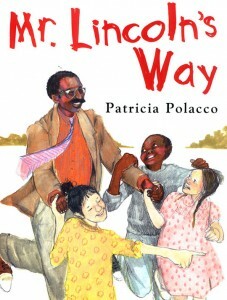 This was another great read aloud that brought out a lot of mature and thoughtful responses from the students. Mr. Lincoln sees that Gene loves birds, and he gets Gene to channel his anger into the positive task of drawing birds to the school’s atrium. And having someone believe in him just makes all the difference to Gene. It’s a hugely sensitive book about acceptance and respect, and the kids responded so positively to it. When Gene starts to go back to his bulling ways by picking on some Mexican students, Mr. Lincoln points out all the different birds living harmoniously in the atrium and calls the students his “little birds.” So to go along with this one we drew pictures of a unique bird–if you were a bird, what would you look like? I only had time to do that activity with one class, which was a shame because they had some great ideas. I’m debating continuing it this week. And then finally, I had the 4th grade classes. 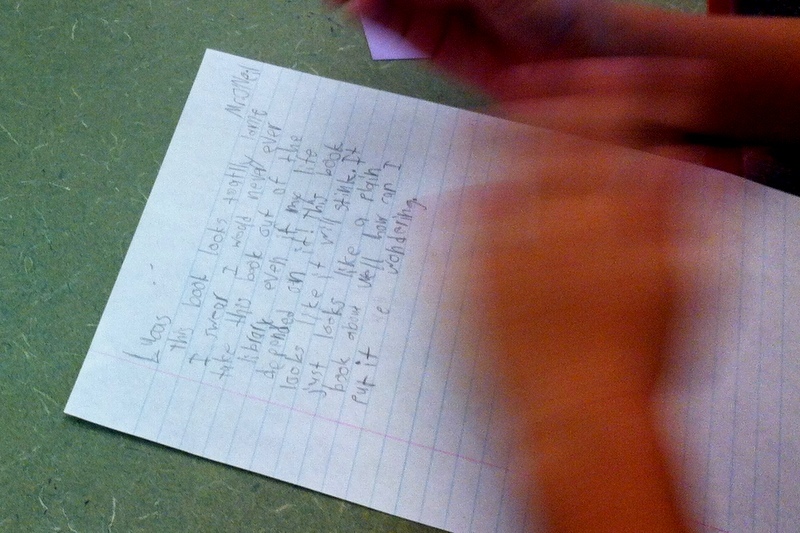 And I started Wonder, our new 4th grade novel. I will write a separate post about what a miraculous book that is, but you can get an idea here. I was observed by my supervisor, principal, superintendent, and 2 prospective board of ed members doing this lesson…and I was really proud of this one. I’m pushing the 4th graders with it, but I talked it out with my principal and supervisor over the summer and got their full support. And I really wanted to start it during Respect Me Week, I haven’t started any other novels with classes yet. 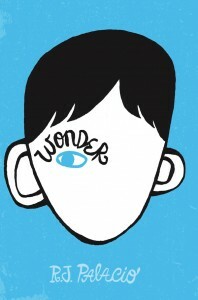 Wonder is about August Pullman, a 10-year-old NYC boy starting 5th grade in a new school. Actually, it’s his first time in any school. Auggie has been home schooled until now because of some serious medical conditions that have kept him in hospitals a lot throughout his short life. And his biggest medical condition is his face. Auggie has some severe facial anomalies. And he’s terrified to start his new school because all he wants is for the world to see him like he sees himself–an ordinary kid, on the inside. But he knows that’s not what people see when they look at him. Ordinary kids “don’t make other ordinary kids run screaming from the playground.” This book is just so amazing. After we shared our thoughts, I told them that I actually loved the cover, but when I first heard about this book and what it was about, I thought I was going to be bored to death. Which is 100% true. Sometimes when I hear about children’s books that deal with diversity and Big Important Issues I assume they will be very heavy handed with the morality and, frankly, kind of insufferable. Without revealing what the book is about, I basically told them the 4th grade version of that statement. And I told them that I could not have been more wrong about this one; by the end I was crying, cheering, and couldn’t believe it was ending. So then I collected their papers and told them I’d be saving them until we finished the book, so we could compare our first impressions with our last. And I read them the first 7 pages (which include the “farting nurse” story of Auggie’s birth) and let them tell me what this book was about. They impressed me, really. They all got it, when I asked why I had them judge the book by its cover first several of them said because Auggie gets judged the same way. And by the end of class almost all of them had already drastically changed their first impressions. Even Lucas. They are officially hooked on Wonder, and I can’t wait to keep reading it with them. It was a great week of discussions, but I’m most excited to keep going with Wonder. This post was wonderful to read. Kids are awesome.